Most of our work is done by two trusted Christians – Tom and Philip – and the people that they have introduced to us. Tom is the visionary. An Australian, he felt the call of God on his life, and left everything. 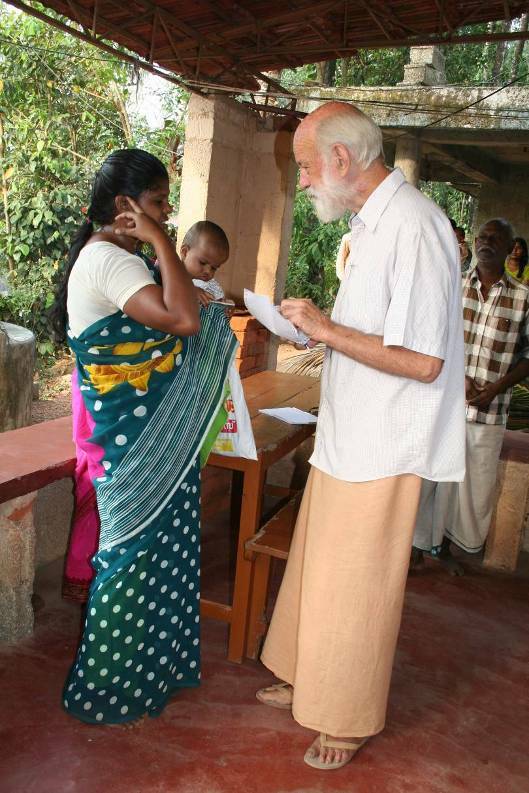 He first worked with Mother Theresa’s organisation, and then established a craft centre near to Nedumangad in southern Kerala to provide employment for the poor. This grew and developed, and he handed it over to others. He now has another, smaller centre a few miles away – The Banyan Tree – at Puthukalangara (more often referred to as Kulappada, and also known as Pazkhutty or Trppaadam), funded by our sister charity The Friends of the Banyan Tree, which continues to provide employment for disadvantaged and low-caste women, enabling them to support their families. He also acts as a magnet to the poor and needy in the area, who come to him for help with medical bills, education, support, setting up small businesses and the like. Contributions to HHI enable him to meet many of these needs. Tom is a remarkable man. He keeps nothing for himself. He has no watch, and for many years no fridge or mobile phone, and little more than the clothes that he stands up in. He lives the life of a poor low-caste Indian, and dresses like one. Everything that he receives he passes on to the needy of the area. Philip is a practical man. A younger man, he is an Indian from further north in Kerala. He looks after the business side of the craft centre, and its administration and finances. He distributes some of the money that we send out each month to people who are further away. And he runs a number of tuition groups as well as our Special Therapy centre in Kalathara. Pastor Santhosh is the director of our very successful special needs centre in A P Nadaroor, a village a bit in the middle of nowhere to the south of Tirunelveli in Tamil Nadu. Over the years this has been built up from nothing into a day centre for 40 to 50 children, with about 20 of these resident 24/7. We also work with Pastor Wilson Kochukunju, who runs an Indian NGO that helps a huge number of people in a great variety of ways - Bethany Gospel Mission or BGM for short. We support the majority of the credit unions that he operates, as well as paying for medical help for people that are in particular need. Salini is a young mother who runs a home for about 25 destitute women, many of whom have psychiatric problems. She is ably assisted by her husband Sanil, mother Valsala, cousin Kingenny and various other family members and friends.